#BREAKING: THE WHITE HOUSE COUNSEL, DON MCGAHN, HAS COOPERATED EXTENSIVELY W/ MUELLER'S OBSTRUCTION OF JUSTICE INVESTIGATION. He has detailed the most damning episodes in at least 3 voluntary interviews that have totaled 30 hours over the past 9 months. - The firing of former FBI Director James Comey. - Trump's obsession with putting a loyalist in charge. - Trump's repeated urging of Sessions to claim oversight of the investigation. - Trump's attempts to fire Mueller himself. #FLAG: MCGAHN AND HIS LAWYER COOPERATED...BECAUSE THEY THOUGHT TRUMP WAS GOING TO SET HIM UP AS "THE FALL GUY." So McGahn cooperated extensively to cover to demonstrate that McGahn did nothing wrong. 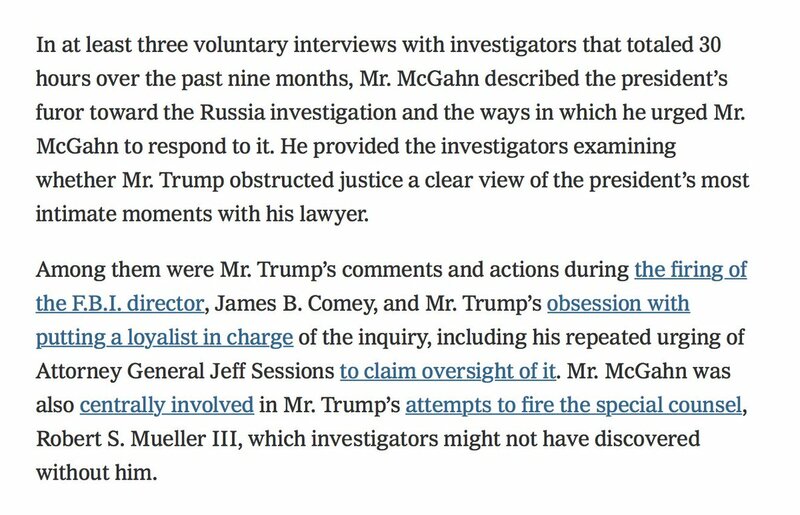 I thought it was interesting that many stories this year painted McGahn favorably...too many. The confirmation that McGahn and his lawyer cooperated to protect himself lines up with who I believed was leaking. ...we ALSO learned that the only reason it didn't happen was because Don McGahn was a "hero," and threatened to quit if Trump went thru with it. McGahn was also involved in those conversations, and told Sessions to back off when hearing of Wray's threat to resign. 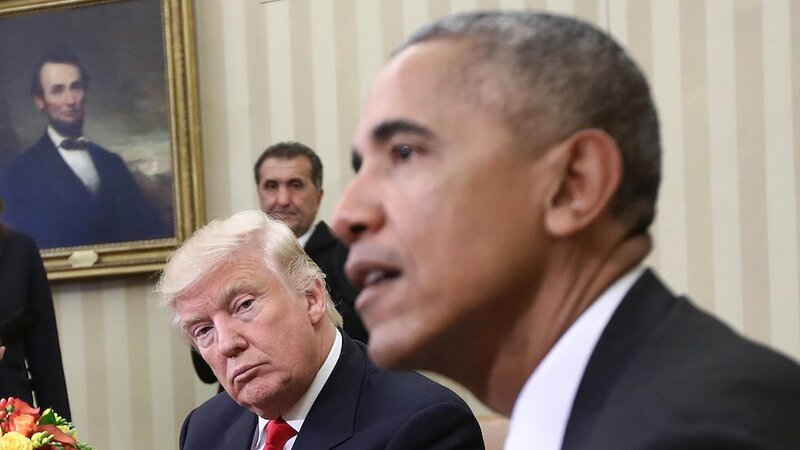 #REMEMBER: In March, we learned that Mueller knew of TWO occasions where Trump was tampering with witnesses. The first was when Trump pressured McGahn to deny he ordered him to fire Mueller. The second was with Reince Priebus, who shares the SAME LAWYER. #REMEMBER: In May, we learned that Trump had Don McGahn LOBBY SESSIONS to NOT RECUSE himself from the investigation back in March 2017. Another story involving McGahn, where he's portrayed as acting under Trump's direction. #BOTTOMLINE: Anyway, all of this to say that McGahn, through his lawyer, has been carefully crafting his public image and getting ahead of these stories, by divulging details that portray him in a positive light. #UPDATE: Trump tweets about McGahn. ...or Trump's legal team is trying to make it look like he is aware and not worried. 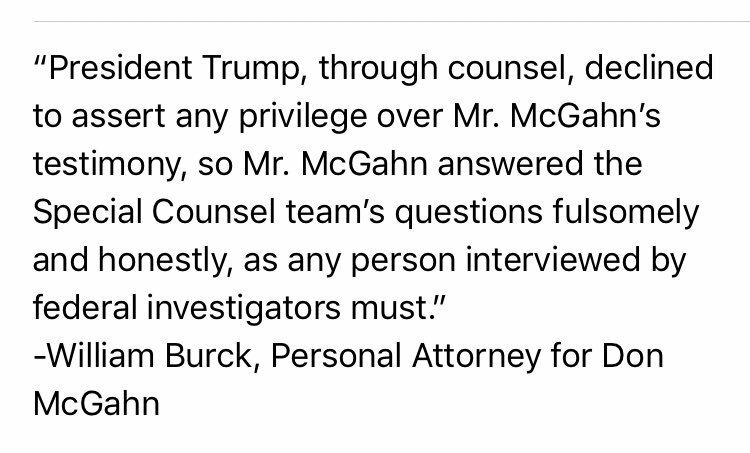 #UPDATE: MCGAHN'S LAWYER RESPONDS (ON THE RECORD). 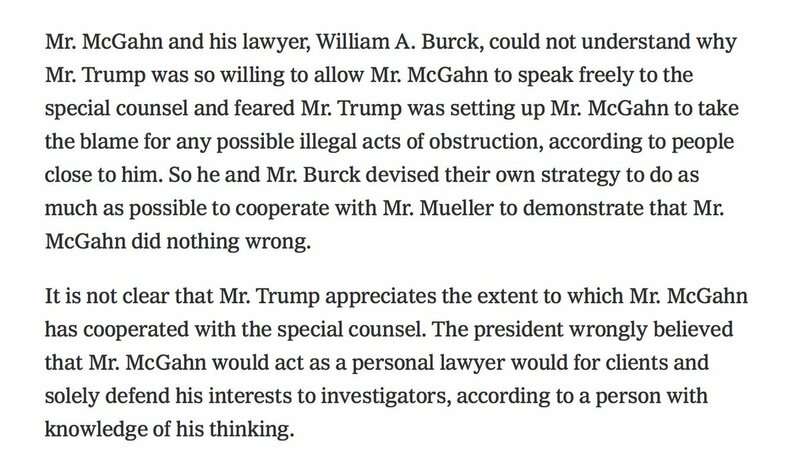 William Burck, his lawyer, essentially confirms the story, but he's sure to phrase it in a way that would alarm Trump the least. But let's be real, Trump would be alarmed by anything less than a defense in the form of lies. #REDALERT: Treasury Dept. to LIFT SANCTIONS on Oleg Deripaska's companies. Treasury's OFAC has notified Congress it intends to terminate sanctions on Deripaska's companies — the oligarch close to Putin w/ ties to Manafort and the Mueller Investigation. Deripaska's companies only qualified for sanctions relief assessment BECAUSE Deripaska "stepped down." But OBVIOUSLY Deripaska installed board members that reported directly to him. #FLAG: The answer to that question is Treasury is being WILLFULLY IGNORANT. restructuring and corporate governance," determine why the moles were installed, and reduce his influence. #BREAKING: Maria Butina PLEADS GUILTY to acting as an agent of the Kremlin — agreeing to cooperate w/ Federal Prosecutors. The "Russian gun-rights activist" is the first Russian national convicted for conspiring to influence U.S. Policy. She infiltrated the NRA and GOP in 2016. #RELATED: Russia, Dark Money, the NRA, and the 2016 election. ...a rule changed the same day Butina was charged. #RELATED: The wife of a former NRA president offered Maria Butina 1 million dollars to secure tons of Russian jet fuel for an American middleman. The scheme would've violated sanctions. Clearly, those around the NRA knew Butina wasn't just an "activist." #KEYTHOUGHTS: Some things to note on Michael Cohen's guilty plea today for lying to Congress about his efforts to negotiate a Trump Tower Moscow deal w/ Russia during 2016. 1/ It's no coincidence that this comes TWO DAYS before Trump's next scheduled meeting w/ Putin at the G20. It directly IMPLICATES Trump himself...and his children. According to Cohen, he gave each of them regular briefings throughout the process. 3/ Cohen admits (with CORROBORATION thru documentary evidence seized by the FBI and Mueller) that Moscow Project negotiations lasted thru JUNE 2016. That's months after the timeline Trump, Cohen, and those around them, have claimed. BREAKING: White House Counsel Don McGahn will be leaving his position this fall, President Trump says in tweet. Senate Judiciary Cmte. Chairman Grassley in tweet to President Trump: "I hope it’s not true McGahn is leaving WhiteHouse Counsel. U can’t let that happen." ⚡️ Day 578: "Truth isn't truth." 2/ Trump attacked Mueller's investigation, calling him "disgraced and discredited" and his investigators "thugs." "It is not clear that Mr. Trump appreciates the extent to which Mr. McGahn has cooperated with the special counsel. The president wrongly believed that Mr. McGahn would act as a personal lawyer would for clients and solely defend his interests to investigators...."
"Worried that Mr. Trump would ultimately blame him in the inquiry, Mr. McGahn told people he was determined to avoid the fate of the White House counsel for President Richard M. Nixon, John W. Dean, who was imprisoned in the Watergate scandal."